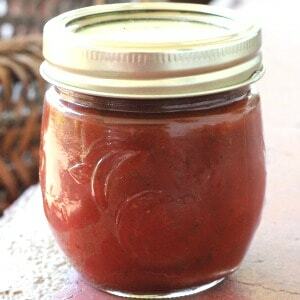 I have made homemade spaghetti sauce before, but I have never tried to make homemade pizza sauce. The other night I made some pizza quesadillas and realized I had forgotten to buy pizza sauce! 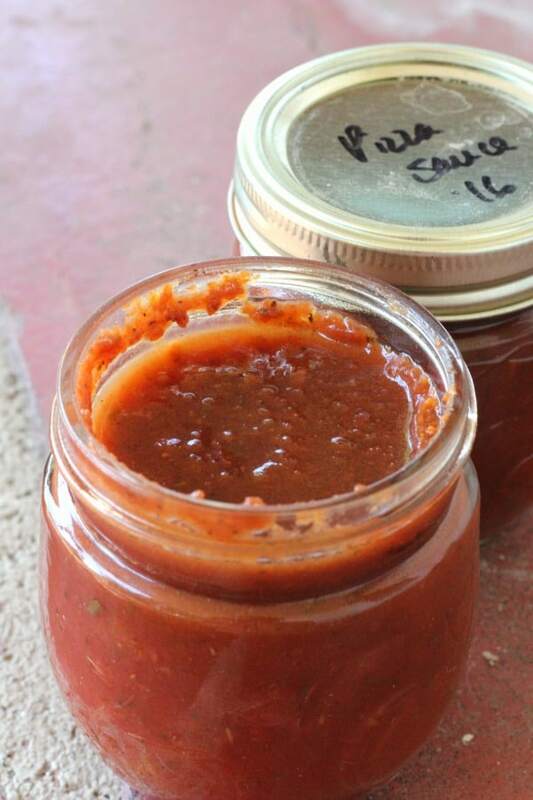 Fortunately I had a quart of homemade canned tomatoes on hand to make this homemade pizza sauce. You can also make it with a 28-ounce can of tomatoes from the store. I also had some frozen tomatoes in the freezer I could have used. This recipe makes 2 pints or 1 quart of canned pizza sauce. You only need one cup of sauce per pizza, so one pint jar is enough pizza sauce for two pizzas. You can easily double or triple this recipe if you want to make a larger batch of pizza sauce. Drain the tomatoes and stir in the remaining ingredients. There are several ways to blend up the tomato mixture to turn it into a nice thick sauce. You can use your blender, food processor, or my preferred method, with an immersion blender. If you use an immersion blender just place all the ingredients in a stock pot and blend with the immersion blender. If you use one of the other methods to blend the ingredients, blend everything together and then place in the stock pot. Bring the pizza sauce to a simmer over medium heat. While the sauce is simmering, sterilize your canning jars, rings, and lids by running them through a quick rinse cycle in your dishwasher. Get out your boiling water canner and fill it about half way with water. Bring the water to a boil on the stove. Remove the canning jars from the dishwasher and ladle the hot pizza sauce into the canning jars, leaving 1/2 inch headspace. You can easily measure the headspace with this inexpensive canning funnel. Wipe off the rims of the jars with a damp paper towel or kitchen towel. Place the sterilized lids and rings on the jars finger tight. Place the jars in the boiling water canner, making sure that the water is covering the jars by at least 1 inch, adding additional water if necessary. Bring the water to a boil, and process the jars for 25 minutes for quarts or 20 minutes for pints. Remove the jars from the canner and place them on a towel on the kitchen counter to cool. Press your finger in the center of the lids to make sure the lids are sealed. If you have any lids that did not seal, place the jar in the refrigerator and eat within the next week. Sealed jars can be stored in the pantry for 1-2 years. If you don’t want to take the time to can your pizza sauce, you can also freeze it. I love these inexpensive freezer containers you can get from Amazon. Just pour the sauce into the freezer containers and place in the freezer for 6 months to 1 year.